I wake up to the sound of rain, the start is not promising. By the time I am about to leave my hotel, it is pouring. 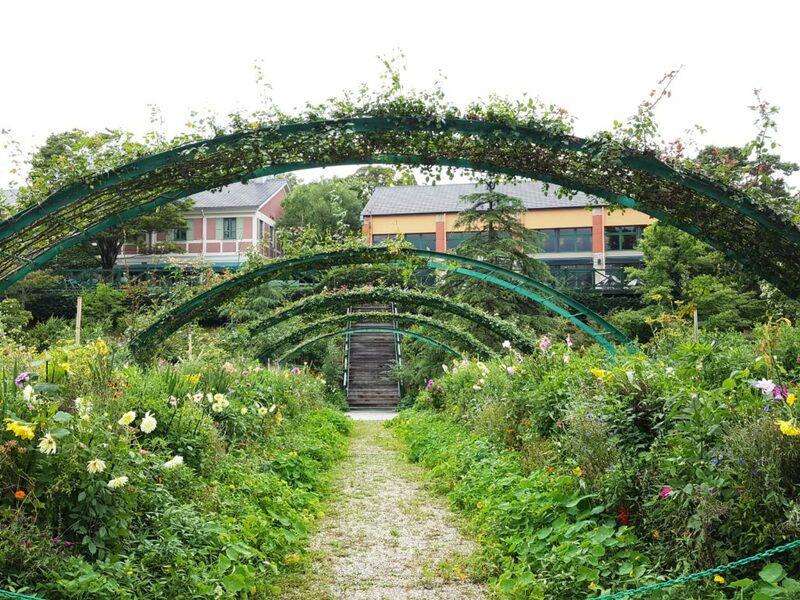 If I told you that my plan for the day is to visit an open air garden, you would think I am crazy. I am almost thinking the same myself. I guess the guy at the JR ticket office thinks so too, looking at me, then outside through the window, then at me again, but he says nothing and hands in my return train ticket to Nahari (I bet you’ve never heard of the place before!). The train is almost empty. We are passing by lush green rice fields, then continue along the sea coast, which you can hardly see because of the rain. 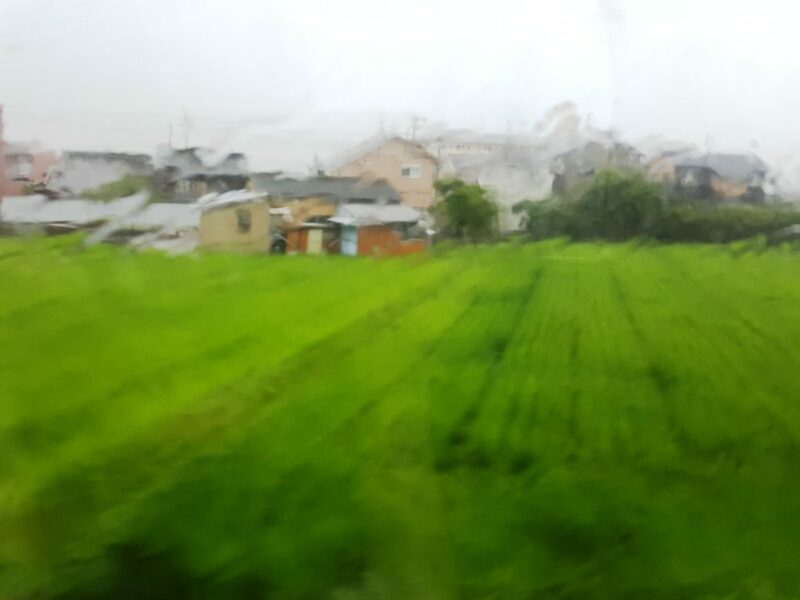 Green rice fields, view from the train window on the way from Kochi to Nahari, Shikoku island. I am looking around if any of those few fellow passengers might be heading to the same destination. I see one guy with a bag full of photographer’s equipment and think, maybe him! But then, he gets off at some random station and I remain the only passenger in the only train wagon. We pass numerous tunnels and to my big surprise and relief, the rain gets lighter and by the time we arrive at the final stop, it is just cloudy, to the contrary of the weather forecast for the day. It comes as a no surprise that I am the only passenger on the shuttle bus. What surprises me instead is that the place I am heading to is so little known even in Japan, not to mention any overseas visitors. 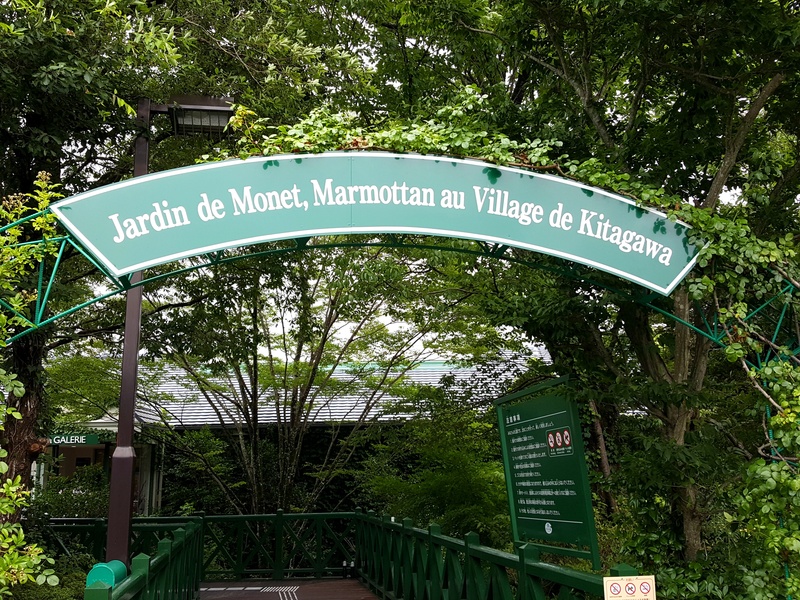 Hidden away in Southern Shikoku island, Kochi province, quite far off the beaten tourist path, comes the only garden outside Giverny in France, that has a right to be officially called Monet’s Garden Marmottan, also known as Jardin de Monet Marmottan au Village de Kitagawa. Monet’s Garden in Kitagawa, Japan, the only official Monet’s Garden outside France. While Claude Monet has never been in Japan, he was known for his interest in Japanese art, especially ukiyo-e wood-block prints (you can read more about movement at the time here) and has borrowed quite a few painting techniques from Japanese artists. 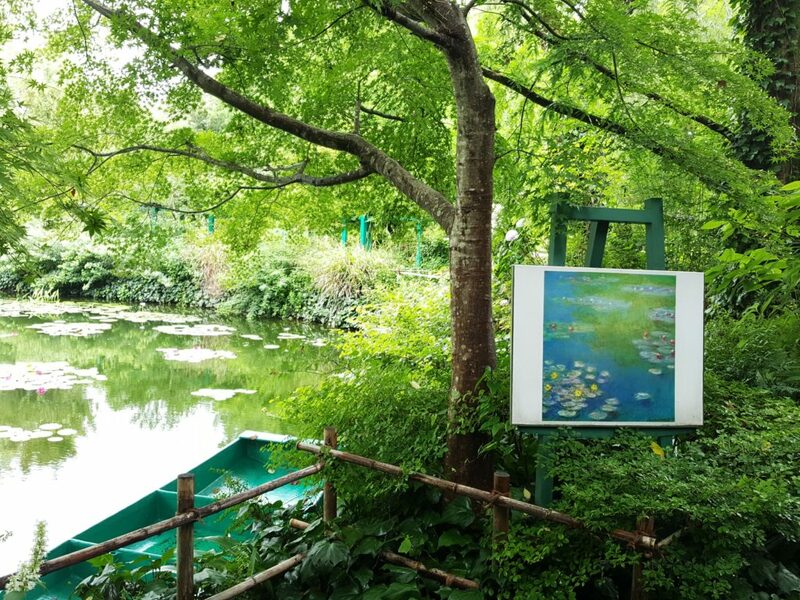 On the other hand, Japanese people like Monet’s paintings (so do I, read here for other Monet related locations), so it may not be a big surprise that it was exactly Japan to re-create the famous painter’s garden. Monet’s Garden in Kitagawa: Water Garden. 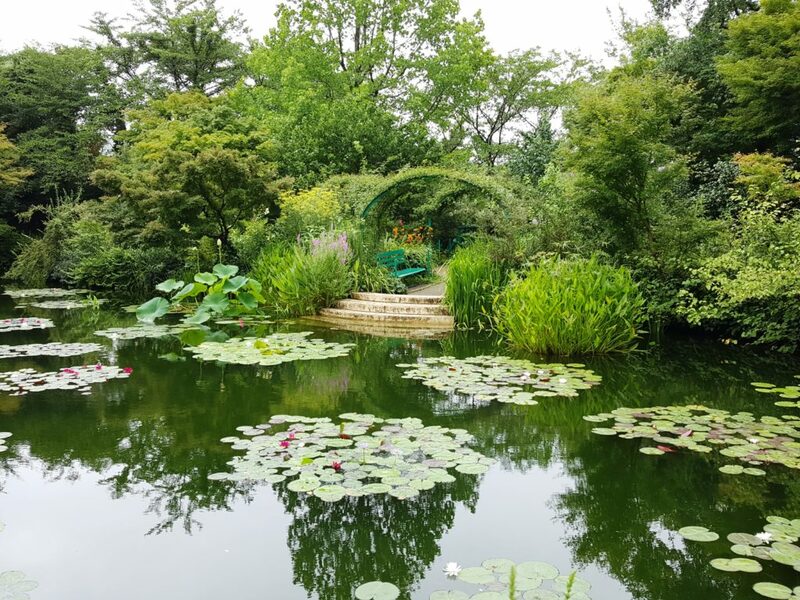 Opened for the occasion of the Millennium in April 2000, the Garden replicates many features of the one in Giverny, including flower arrangements, Monet’s house, pond, Japanese bridge, willow trees, bamboos, and of course, water lilies. Monet’s House and Garden in Kitagawa: Flower Garden. Water lilies at Monet’s Garden, Kitagawa. Given very different nature and climate conditions (just think of regular tropical typhoons! ), it must have been a real challenge! 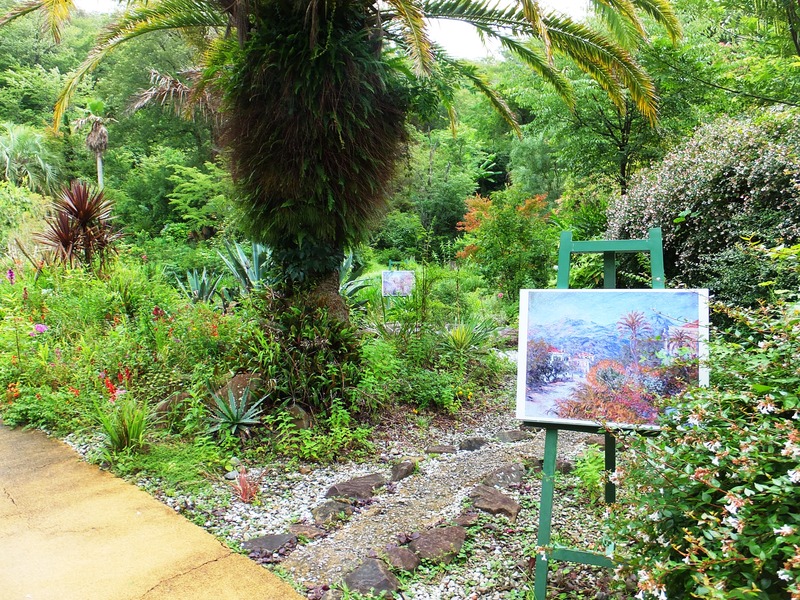 The gardener Yutaka Kawakami has been awarded a French award, a rank of Chevalier in the French Order of Arts and Letters for his work at Monet’s Garden in Kitagawa. View over the Flower Garden and the surrounding hills. Kitagawa, Japan. Monet’s Garden in Kitagawa consists of three gardens: Flower Garden (Hana no Niwa), Water Garden (Mizu no Niwa), and Light Garden (Hikari no Niwa). Monet’s Garden in Kitagawa, Japan. 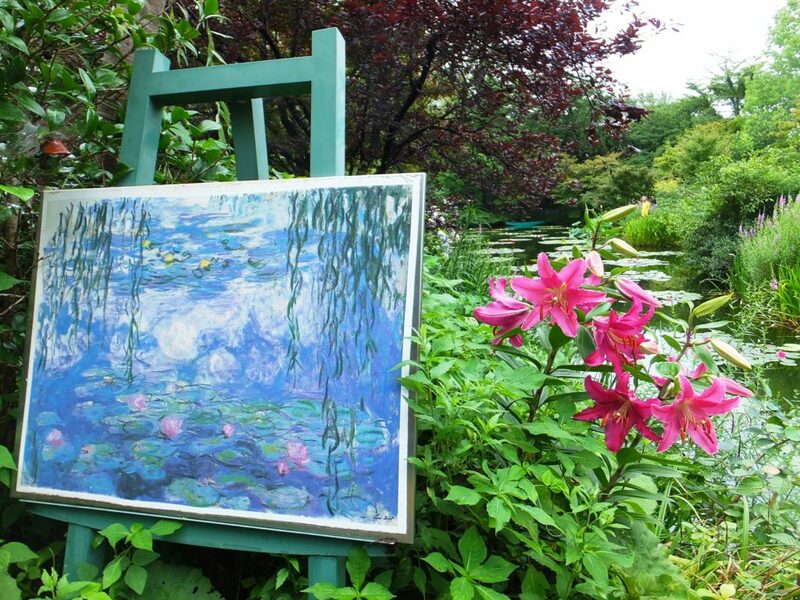 As mentioned, in many aspects it is a replica of the one in Giverny, yet, the last one, the garden of Light is unique, created with a special permission of the Monet’s Garden in Giverny, and is dedicated to Monet’s expedition to the Mediterranean Sea and its surroundings. Light Garden, Monet’s Garden in Kitagawa, Japan. 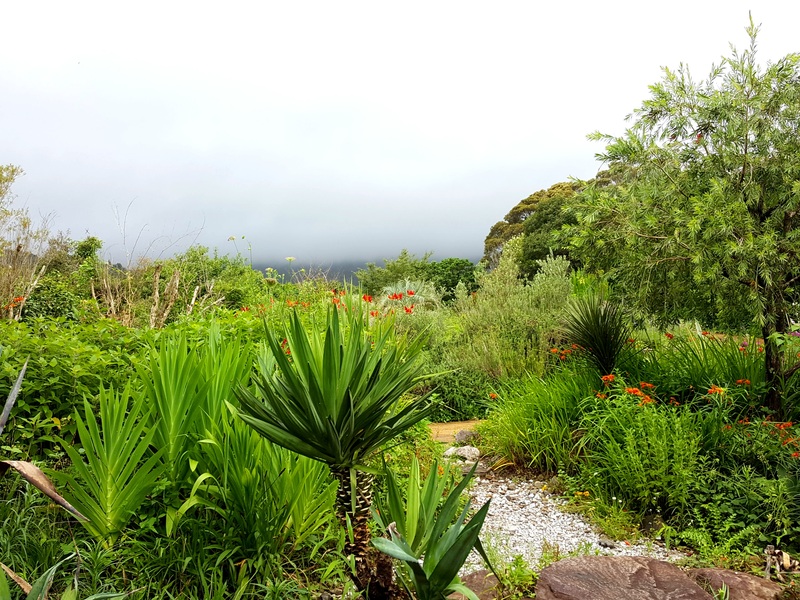 The nature and climate conditions of Kitagawa allow to recreate a Mediterranean style environment with palm trees, olives, exotic flowers and a lot of natural light. 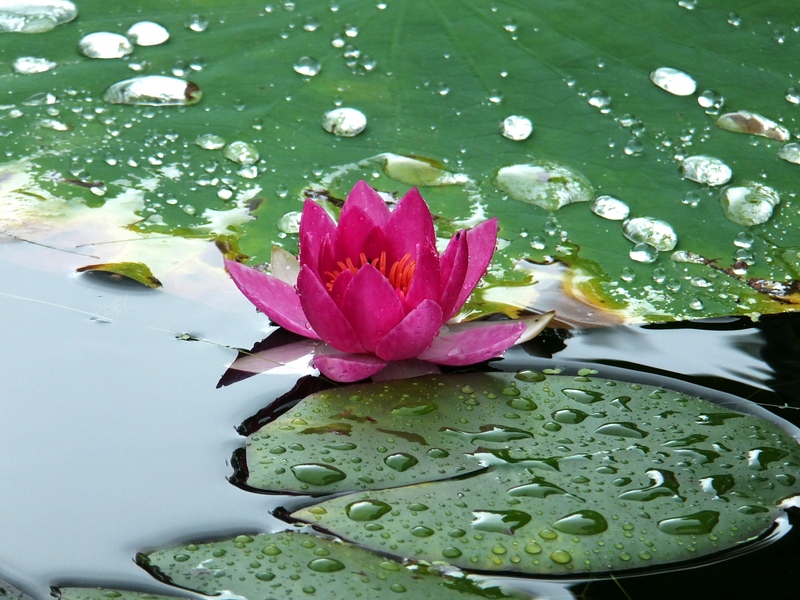 Yet, my favourite is the Water Garden, where water lilies bloom from late June to early November. 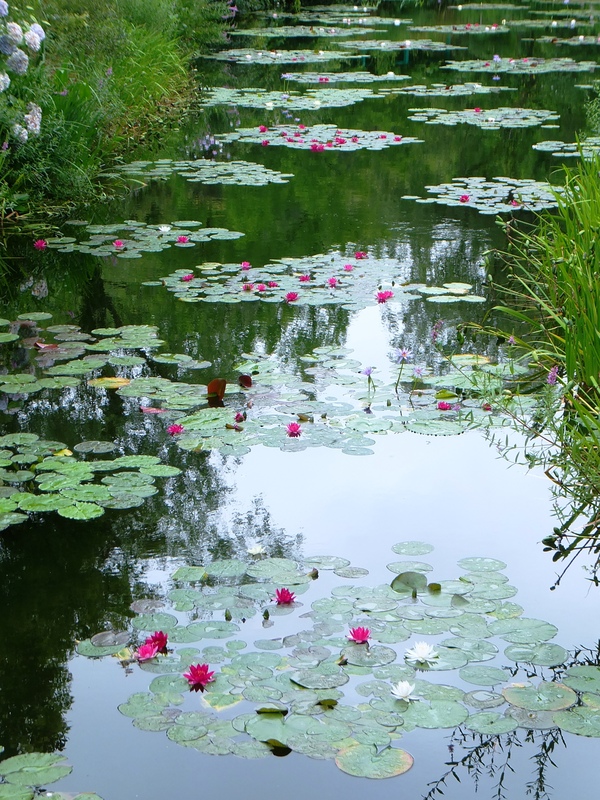 The Kitagawa Monet’s Garden is proud to have rare blue water lilies, which, as they say, was a Monet’s dream. 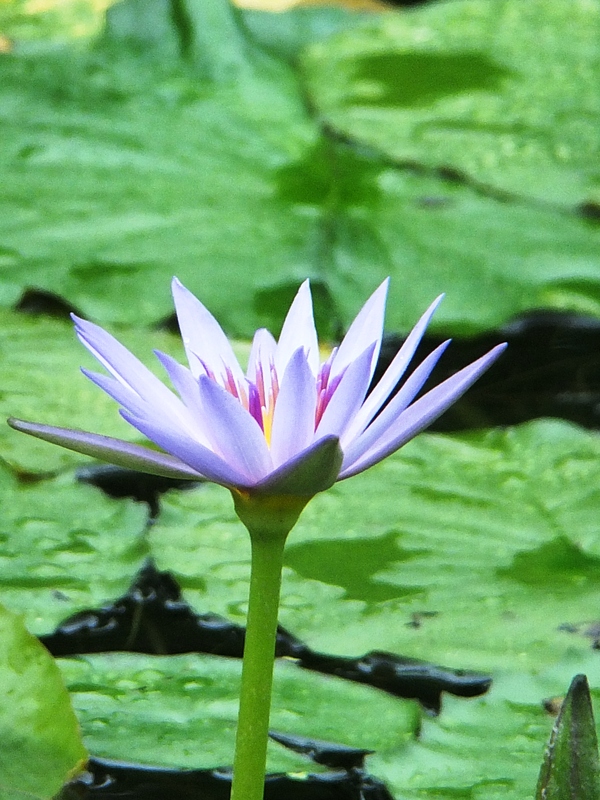 The rare blue water lily, can be seen only in Monet’s Garden in Kitagawa (not in Giverny!). 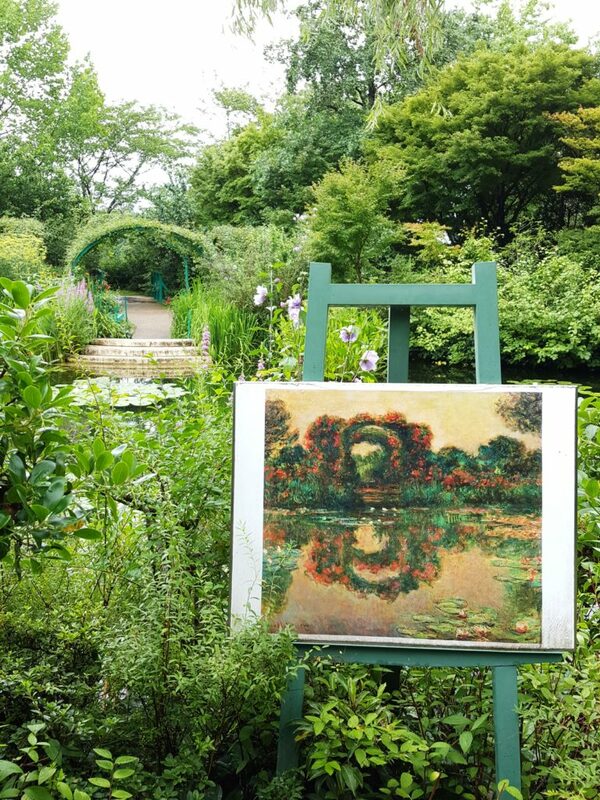 Several replicas of Monet’s masterpieces are installed in the gardens, so the visitor can compare and enjoy both the painting and the views that inspired them. Monet’s paintings in the Monet’s Garden. Again, all alone in the shuttle bus to the train station, I am wondering why the Garden is not promoted that much. While there were some Japanese visitors, there could be more. 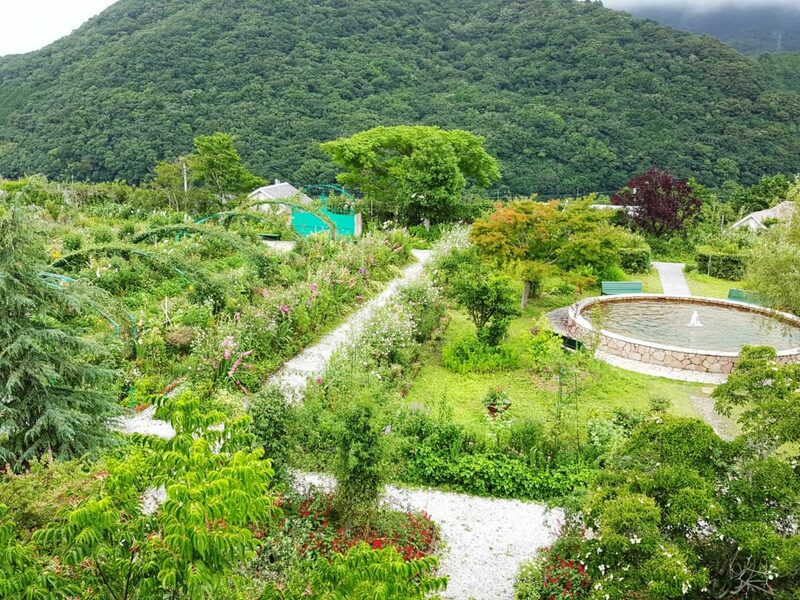 None of my Japanese colleagues were aware that such garden even exists! I learned about it by accident after three years in the country, but hope that this post will add its bit to raising the awareness and interest. Getting closer to Kochi, it starts raining again and it intensifies with station we pass. By the time I get back to Kochi, it is pouring the same way as when I left in the morning, thus, the whole day seems a bit surreal, as if the walk around Monet’s Garden on a nice summer day was a just a dream, or a small miracle, depending on how you want to view it. p.s. continuing Monet’s topic, Yokohama Museum of Art will be opening an exhibition “Monet’s Legacy” on July 14th, displaying a number of Japanese and Western artists, who were inspired by Monet. The exhibition will run until September 24th. Don’t miss a chance if you happen to be around! This entry was posted in Discovering, France vs. Japan, The rest of Japan and tagged blue water lily, Giverny replica, Jardin de Monet, Jardin de Monet Marmottan au Village de Kitagawa, Kitagawa, Kochi, Monet, Monet and Japan, Monet's garden in Japan, Monet's Garden Kitagawa, Shikoku, water lilies by Madame. Bookmark the permalink.